Erik C. Tom | Summit Consultants, Inc.
Erik joined the firm in 2018 as a paraplanner. He assists the advisors with multiple tasks, including client meeting preparation and follow-up, investment research, and other special projects. Prior to joining our team, Erik worked as a banker at JPMorgan Chase, focusing on small business banking needs. 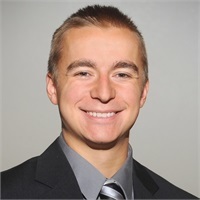 Erik earned his BA in Economics and Political Science from Indiana University-Purdue University Fort Wayne in 2015. He currently holds his securities registrations with LPL Financial, as well as state insurance licenses. Outside of the office, Erik and his wife, Lauren, enjoy spending time with their dog and two cats, as well as hiking, kayaking, fishing, hunting, and enjoying the outdoors.